On 29 September at 20:00 everyone was invited to attend a concert by Lucas Abela. Barefooted, in ragged jeans and a worn-out T-shirt Lucas Abela (a.k.a. 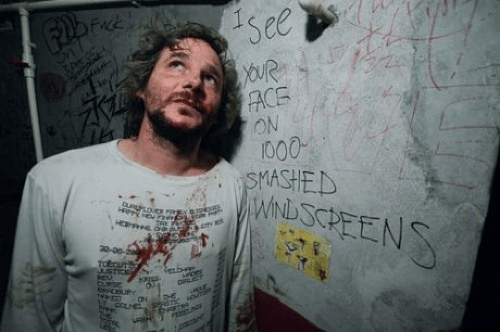 Justice Yeldham) leaves nobody indifferent. The bearded savage of the Australian noise has been shocking and causing awe with his short, intensive and innovatory performances for over 20 years. “I’m not trying to drive people out with my noise. I’m more interested in engaging people within the physical aspects of sound, not – ‘I’m loud take this!” Lucas Abela explains. His early performances were amazing interpretations of DJing. Instead of record players he used engines which turned metal discs with 2000 revolutions per minute and instead of stylus – knives or pliers. At another performance Abela had riveted a glove with styluses. His imagination knows no limits – he has used trampolines and sewing machines in his performances. Thus of no surprise his performances attracted attention of the legendary BBC DJ John Peel – he invited Abel to take part in the famous John Peel Sessions. Abela characterises himself as a showman and denies being a performer – “If moving while playing makes one a performance artist and not a musician, I better sit down. Because of my unconventional instrumentation I am too often written off as a conceptual artist when conceptually I’m far more versatile. I produce sounds, a wide array of them, but people can’t seem to get past the performance element of my shows to actually listen. (..) Essentially I’m an improviser in the jazz tradition of free jazz, however the instruments I use create noise, hence free noise.” Constantly overstepping the boundaries and using the strangest instruments – everything at hand, foot or mouth – Abela has managed to add the most extraordinary sounds to the wide palette of noise.